In case you missed it, Raleigh News & Observer had a great editorial over the weekend about the proposed constitutional amendment to require voters to produce a photo ID. If you’re a registered voter in North Carolina, you were issued a voter card from your county board of elections. It contains some basic information about you, including your address, voting place, precinct and in which election districts you reside. This is your official notification from your government that you are a registered voter. And, if a constitutional amendment requiring a photo ID to vote passes in November, you probably won’t be able to use your voter card in 2020 to vote. Got that? You probably won’t be able to use your official voter card to vote. How absurd is that? 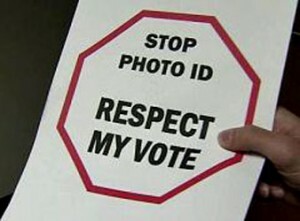 Because even though the card says you are a registered voter and gives your voter ID number, it doesn’t include a photo. You couldn’t make this up. No serious governing body would take that approach. That’s not legislating; that’s grandstanding…. Republicans say they want to stamp out voter fraud….OK, we’ll play along. Let’s say there’s limited voter fraud now but we want to head off a potential problem by taking precautionary measures. But any precautions can’t infringe upon North Carolinians’ right to vote, which is guaranteed by the state constitution. Strong democracies make voting as easy as possible.